However, the use of the apple and the nails inside, I gathered that this was about either not wanting someone’s love or how someone had hurt them. But because of the tougher style, I’m leaning more to the former. Also, apples have been used to represent hearts a lot in kpop, the one that comes to mind first is ‘Heartbreaker’ by GD. (You can see the rest here). Of course, the main singers: TaeYeon, Tiffany and SeoHyun were wonderful. I will say I’m becoming more and more in love with TaeYeon’s voice recently. And Sunny! She was fantastic! This more mature and pop/hip-hop vibe really works well with her voice. The harmonisation at the end was also really good and having so many different lines and styles wasn’t overpowering, but made a great ending to the song. 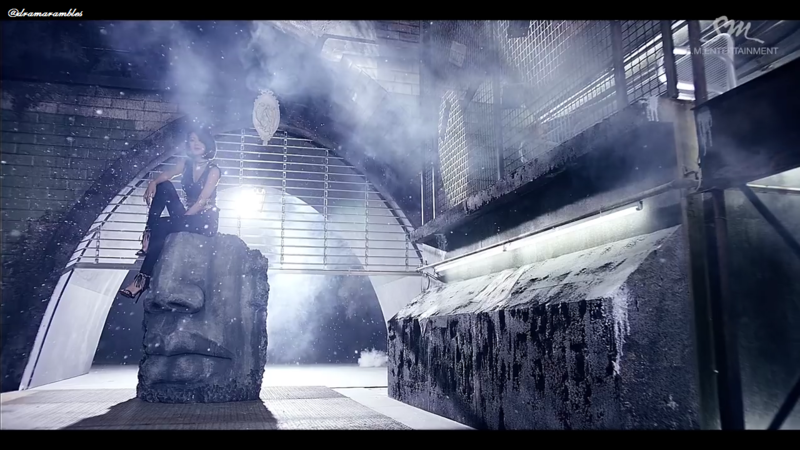 I actually really like this MV. The darker colours aren’t really something to expect when you go to watch a SNSD MV. These colours are more likely to be seen in male group MV’s concerning SM (not that they have many artists at the moment *went there*). Mixing the darker, tougher landscape with the feminine colourful boudoir-type set was great. Also the orange screens made for a nice interlude of colour. Also, well done to the choreographer! This reminded me kind of like a sexier ‘I Got A Boy’ feel. The leg spread in here matched the music and the tone of the MV, which is why I have no problem with it, like I did in ‘Lion Heart’. The stand out dancers for me in this MV were YuRi, SooYoung and of course HyoYeon, which makes sense!~ I did feel that Sunny did really well. This type of style really suits a lot of the members. I did think that in some parts, while watching SeoHyun, that this was perhaps not so up her alley. The split/crawl thing was something I felt uncomfortable watching and was concerned because it didn’t look comfortable at all! However, saying that, this is a style that I hope SM keeps giving them! They are grown women and I think that this style could be good at maturing their concept, allowing for their growth and ensuring they stay relevant (not that this will be a problem any time soon though~).